And i am planning on ordering a tac light to go with it and was just wonder do i need to buy anything else to attach it or would it come supplied. what tac-light you getting?, some come with a method of attaching, mine, I had to buy the fixing to fit to a rail for the torch to then fit in....all same make, got a pressure pad as well for it but not used it yet. There are other options out there ive noticed for fixing the torch to the rail.....I just cant post links , forum/pc don't like each other! ZeroOne advertise it as being a 20mm Mount....so I'd *assume* that any RIS Mounted Kit should work. It would be worthwhile calling ZeroOne and asking them for sure, their tech-team are pretty damn good. Google seems to have some very vague answers on this - or I'm just searching the wrong thing. It has a full length 20mm picatinny rail across the top for optics. those rails you linked are out of stock matey. They are trying to copy real steel guns which have lots of keymod accessories now. Great if you want a £500 flashlight not great if you want a cheap replica. There are more slowly coming out and if you shop around you can find keymod accessories just not as common yet. My Krytac PDW rail is keymod and I struggle to find accessories for it in UK retailers, but this may change soon, who knows! So, I have had to mount Picatinny rails on it. If whatever light you end up buying can't mount to the 12 o/clock rail, I'd recommend sticking to the KeyMod sections by the same brand as your gun. Some airsoft companies KeyMod is cut to the same spec as the real thing, but a lot aren't and it's often impossible to tell before actually purchasing the product in question. Matching up the rail pieces to the gun in terms of manufacturer is the safest bet. I'm yet to see a light that had a body which facilitated direct mounting to KeyMod slots personally, the closest things I've found are certain mounts which replace the normal picatinny mounts on SureFire scout lights (and presumably the clones). 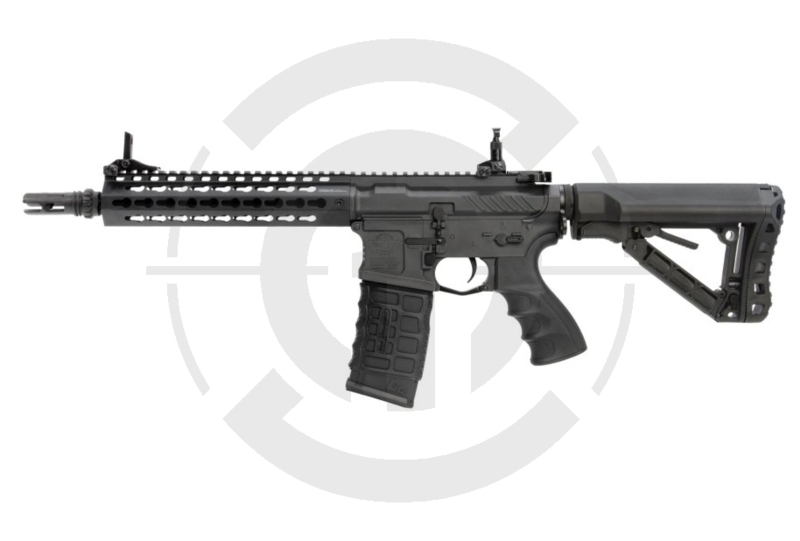 If your gun does have KeyMod up front but isn't supplied with any rail bits that is certainly a slight downer value wise, however the same gun with a metal forend that had picatinny on all 4 sides would probably have cost quite a lot more in the first place before you even get to the fact it weighs more and to most people isn't as ergonomic (in terms of shape/size and the cheese grater effect). There was a couple I came across a while ago but cant seem to find them now, might not have been enough demand for them to become a constant production item. You can get a quite a few mounts suitable for surefire scout lights but be careful if getting one for a clone because some of the clones are terrible. You can get quite a lot of foregrips that attach direct and a few other accessories. Several companies claim to be working on direct mount keymod accessories as its becoming the industry standard. NB: I AM NOT SAYING GET THIS CHEAPO OVER A G&G !!!! But WTF don't companies put ONE rail in there FFS !!!! C'mon - a friggin rail to get ya going, drop the small pack of bb's or something ??? Is that addressed to me or a continuation of what I was saying? With the quote in there I can't really tell. It's not necessarily as bad as all that. There are only 2 types of KeyMod hole, the real spec and the airsoft one; I suppose given airsoft manufacturing tolerances (lol) the airsoft ones could potentially vary somewhat which would necessitate matching manufacturers forends to accessories, but a lot of other parts on airsoft M4s are interchangeable between brands so I'd wager they're probably all close enough in the vast majority of cases. The problem is more that the information hasn't gotten out there in terms of how to tell the difference between the real and airsoft spec, so people aren't aware which brand uses which in order to then inform others. AFAIK, Krytac and PTS use the real spec on their handguards whereas G&G and Madbull do not. The other 2 'big names' producing a large quantity of KeyMod forends right now would be G&P and ICS, but I've never got a look at any of the new range of guns from either to be able to check. Most likely though they're also using the more simplistic airsoft spec cuts. Don't get me wrong, don't disagree with that at all. A plastic rail piece wouldn't cost much at all, they could probably raise the price of the guns by £1.50 and easily cover it. The spacing isn't actually the variable (certainly shouldn't be anyway) it's the shape of each hole. On firearm-spec handguards they have to cut chamfers on to the inside face of each slot, which is obviously a bit tricky and pricey to do since you have to have a machine that can cut at very funny angles/from the inside of a narrow tube. A lot of airsoft manufacturers just just the holes straight from the outsides, so they look the same externally without closer inspection but they don't provide the same functionality or fitment. I've not have the chance to try an RS accessory on an airsoft handguard yet unfortunately. Should probably start just bringing one with me to games, I'm sure I'd spot someone with a G&G or ICS and then I could say for sure what's compatible with what. The spacing isn't actually the variable (certainly shouldn't be anyway) it's the shape of each hole. On firearm-spec handguards they have to cut chamfers on to the inside face of each slot, which is obviously a bit tricky and pricey to do since you have to have a machine that can cut at very funny angles/from the inside of a narrow tube. Thats actually an easy process on a cnc milling machine. There are loads of back chamfering tool on the market. 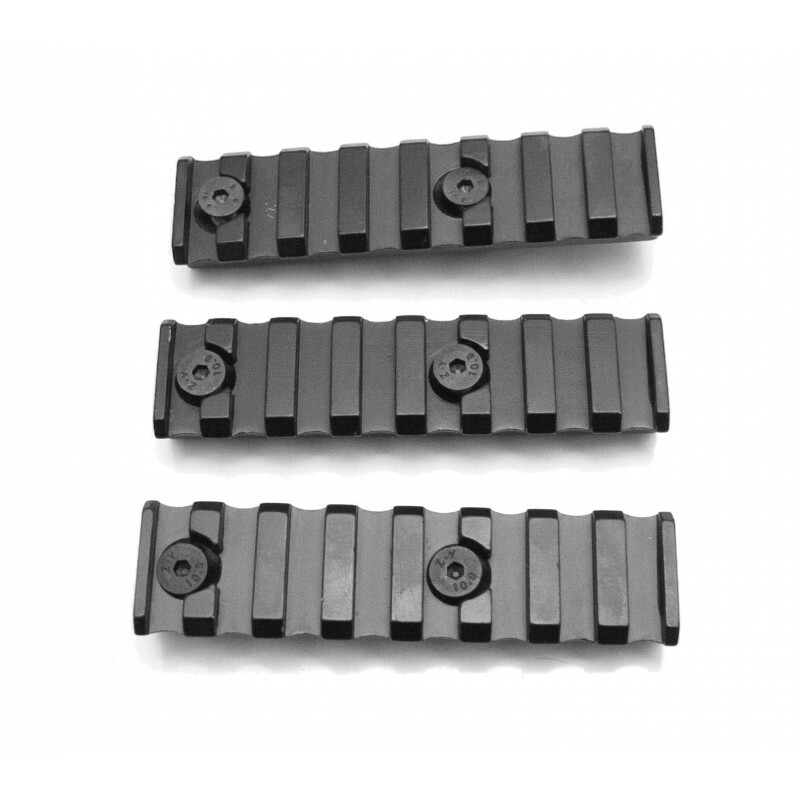 Keymod rails should be relatively cheap to make especially in bulk. As long as its aluminium you could get the basic shape extruded and then just finish it on a cnc machine. Once everything is set up with a rotational jig shouldn't take that long. Probably still a bit much for cheap airsoft guns but certainly possible on some of the higher priced guns. Can't say I'm a machine expert, so thanks for the input. All I can say for sure is that M-LOK is cheaper to mill than KeyMod and a lot of airsoft companies don't put in the necessary chamfers in to their KeyMod because they're trying to keep prices as rock bottom as they physically can. It's all relative of course, as you say it may not be that expensive in terms of tooling or machine time, but it is enough of an extra cost that G&G ét al want to avoid it. Probably more about time than tool cost if anything, G&G especially must be pumping out guns at a crazy rate seeing as they're supplying every country in the world by the looks of things. Just sticking to the standard picatinny rail is easier. Lots of accessories and with a foregrip quite comfortable. If aint broke dont fix. As for G&G they are just mass production cheap sh*te. Worst quality materials of any of the big manufacturers. Edit; M-lok is definitely better and looks nicer. Keymod always makes me think of supermarket racking. Keymod always makes me think of supermarket racking. Wish some airsoft companies would start adopting M-LOK, getting accessories is proving to be a real PITA in the UK, already bought a load from the US, but would rather avoid that. I've got the srl, its great you'll have fun with it! I'm out of stock on the website but I'm sure I can find a spare set for the OP. Hopefully I have another 200 of these arriving in the new year. my ICS AEG came with 3 rails for the keymod rails ....thought it was standard?